The GSCR staff has been wonderful to work with. We've rented several times through them and won't ever be going to another rental company. From the moment they answer the phone to the end of the conservation they are upbeat, pleasant and helpful. By the end of speaking with them you feel like you've just made a new friend. I absolutely loved this property. I'm already looking to see when I can make the return trip! Tremendous value for the price. Ease of check-in. Nothing is worse than having to travel out of your way to an property office after a long drive just to pick up your key. Did I say tremendous value? We had a blast!! The Cabin was AMAZING!!! The view was beautiful. We will most certainly be back. Beautiful Cabin and very clean. We had an amazing time and we will be coming back. Thank you so much for suggesting such an amazing property. Great Place. We loved making family memories here. Amazing Cabin! Beautiful, comfortable, fun and family friendly. My son and husband and I cam here for our "Family-moon." My husband and I were married a week ago and we are expecting our second child due in May so instead of a honeymoon we decided to do a familymoon. We have fallen in love with this cabin and have decided to make it our annual family vacation to the mountains. We are definitely returning in the spring. It was great.They are really helpful at any time of the day. Wonderful place!! We just love it !! The team members are very easy to work with and willing to help meet the specific needs of the customers. We loved our time in Owls Roost--in fact we plan to return for a couple's retreat one weekend with our good friends! We were looking for a less rustic cabin experience and Owls Roost fit the bill perfectly. 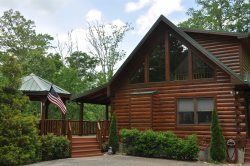 It was reasonably priced and had all the comforts of home, while still providing the perfect mountainside setting we sought! The screened porch was a favorite of mine--perfect for morning coffee and afternoon/evening lounging! My wife and daughter spent more than a few hours napping, reading and relaxing in the over-sized porch swing! Finally, the kitchen was incredible! We really enjoyed staying in this cabin. During our trip, we went hiking in Deep Creek and to the top of Water Rock Knob. We also visited Chattahoochee. This cabin has such a beautiful view of the mountains, and we loved the rocking/swinging on the porch and making S'mores on the screened in porch. We would love to stay here again. This place is absolutely lovely! The view is breathtaking and the cabin is gorgeous. We went white water rafting which was awesome. We hope to do it again. We took the train to get there about 2 hours. It was filled with wonderful views and a good experience in general. Close to hear is Deep Creek, it was awesome. You can go tubing, horse back riding, or just walking through their many trails. It was gorgeous. We saw three waterfalls and beautiful brooks. We hope to come back soon. it exceeded our familily expectation, we had a great time! The follow up call once I arrived at the cabin was a great personal touch! The directions were a little tough to follow leading to the cabin. Great Customer Service. I referred a neighbor and they have also had a great experience. Beautiful Cabin. We loved every room and all the wonderful details. The views were amazing. I would love to come back to this cabin again. This was my families first time staying at one of these cabins. Wasn`t really sure what to expect but when we got there the cabin, view and everything else was amazing. Can`t wait to go back!!! I think that we can all say that we thoroughly enjoyed our visit at the Owls Roost Cabin! I really liked the owl door. Also the cabin had a very rustic feel. We will miss JO JO the dog. He enjoyed sitting on the bed swing. He loves people! He is a loving dog and we really enjoyed him as well thank you for such a great cabin. Loved, loved it!! Our family comes to the mountain from the Low country of SC several times a year. We stay in a different cabin each time as we look for our favorite location and favorite cabin. We, this is it. The house is very comfortable, the kitchen is well equipped; but the best part of all is the porch. We had a fire almost all day every day & ate more marshmallows than should be allowed. We rocked and rocked, slept on the bed swing & hiked the trails of the Hemlock Inn. We fell in love with the neighbors yellow and white dog. He is so lovable and hiked with us every day. We will be back our first repeat later this year.